There are several methods for hydrogen peroxide production, among them the AO(auto-oxidation) process is the most prevailing one. In this process, 2-alkyl anthraquinone is mixed with organic solvent to make up the working solution, which is hydrogenated in presence of catalyst, and the resulting is oxidized by air (or oxygen) in counter-current way before being extracted, regenrated, purified and enriched to get commercial hydrogen peroxideproduct. 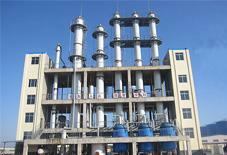 Depending upon the different reactor type in the hydrogenation unit, AO process is further divided into Fixed Bed Reactor Process and Fluidized Bed Reactor Process. SL Tec provides both processes. 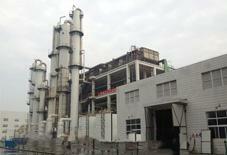 The Fixed Bed Reactor Process SL TEC provides is the most advanced technology in China. It employs heavy aromatics-TBU-TOP tertiary solvent in the working solution and alumina-supported Pd catalyst with high activity. 1.Advanced DCS control system, SIS safety system and industrial video monitoring system are set up. The optimal control, alarm and safety interlocking of various process parameters in the hydrogen peroxide production process are realized. Implement video surveillance for key point control points and key positions. Ultimately, the entire system is stable, high-yield, low-cost and safe. 2.Concentration adopts the world's most advanced falling film distillation technology to make the residence time of hydrogen peroxide solution in the falling film evaporator short to avoid the decomposition of hydrogen peroxide; in addition, the evaporator uses low pressure saturated steam to make the effective temperature difference ≦8~10 °C, which saves steam consumption while reducing unit consumption. 3.The Fenton oxidation method + biochemical treatment sewage technology has been successfully applied, so that the sewage of the hydrogen peroxide device is completely discharged after being treated. 4.System-wide air release for centralized recovery and disposal of the system. The unorganized exhaust gas is recovered and there is no odor on site. It not only reduces solvent consumption, but also improves the working environment and meets the requirements of occupational health and environmental protection acceptance standards. 5.The post-treatment drying column uses high-efficiency reaction and separation of filler packing. Solved the problem of causing alkali in the drying column. The burden on the subsequent activated alumina bed is alleviated. Reduced consumption of activated alumina. At the same time, it ensures the long-term operation of the system. 6.The purification column uses high-efficiency oil-water separation of coalescing fillers to greatly reduce the organic carbon content in the product. The organic carbon content of the product meets the needs of high-end users. The product does not need to be purified. 7.High-efficiency tail gas solvent recovery process—the combination of turbo expansion refrigeration (power generation) + solvent recovery + carbon fiber adsorption recovery process. At present, the treatment of hydrogen peroxide tail gas in domestic hydrogen peroxide generally adopts the combined treatment technology of turboexpansion refrigeration and activated carbon fiber adsorption, which has achieved good results in tail gas treatment. However, as the carbon fiber usage time increases, the adsorption performance decreases, and the adsorption recovery effect is affected. It is difficult to truly achieve exhaust gas emission standards; another solvent-collecting recovery device developed by Fourpeng can recover 80% of the solvent in low-temperature exhaust gas, reduce the load of activated carbon fiber, prolong the service life of activated carbon fiber, and reduce The regeneration frequency of activated carbon fiber reduces the consumption of regenerated steam and the consumption of aromatic hydrocarbons, so that the oxidation tail gas is truly discharged. 8.High-efficiency extraction column, high-efficiency oil-water separation and extraction technology to ensure high extraction concentration and low raffinate. Whether the hydrogen peroxide production unit can stably produce higher concentration products depends on whether the residual hydrogen peroxide content in the raffinate working fluid is controlled within a lower index (safety index). It is necessary to obtain a higher concentration of hydrogen peroxide product and control a lower raffinate. In addition to the higher hydrogenation efficiency, higher oxidation yield, and reasonable solvent ratio of the device, the distance from the sieve tray of the extraction column and the sieve The size distribution of the holes, the speed at which the working fluid passes through the mesh holes, the thickness of the working fluid under each sieve plate, and the level of the sieve plate installation are closely related. Luoyang Fourpeng Company adopts optimized extraction column structure and designed high-efficiency oil-water separation technology to stably produce hydrogen peroxide products with a concentration of more than 35% in the safety index. At the same time, the volume of the extraction column is reduced by 20% compared to the conventional process. 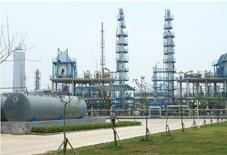 9.Efficient distribution, gas-liquid mixed high efficiency oxidation column. Using the successfully used oxidation column technology, the reaction section is set up and the baffled mixed oxidation column has been successfully applied in multiple sets of equipment, so that the oxidizing working fluid and the oxygen in the air can be thoroughly mixed and reacted, the generation of the residual liquid is reduced, and the oxidation is collected. The rate has increased to over 98%. 10.Hydrogen peroxide production costs almost 1/2 of the cost of production, while oxidizing air compression is a major consumer. The SL TEC oxidation system uses an advanced operating method to reduce the oxidation operating pressure while maintaining the oxidation yield. At present, the outlet pressure of the air compressor in the hydrogen peroxide production process is 0.5~0.6MPa, and the outlet pressure of the SL TEC air compressor can be reduced to 0.40~0.45MPa, which is 20% more energy saving than the air compressor of the existing process system. 11.The hydrogenation reaction is the main reaction in the production of hydrogen peroxide, and the hydrogenated palladium catalyst is the core of the hydrogenation reaction. In addition to its high catalytic activity, the palladium catalyst produced by our company has excellent cesium hydrogenation selectivity. Under high hydrogenation efficiency, the enthalpy consumption of tons of products (27.5% of the concentration) can be reduced to less than 0.2kg. Is one-fifth of the industry average. At the same time, the reduction in consumption has led to a significant reduction in other chemical raw materials. The overall consumption of chemical raw materials is 1/2 lower than the industry average. Note: Total carbon and nitrate are non-mandatory requirements, and other items are mandatory. Note: The device operation flexibility is 60~110%.